There is Good news for robot lovers. Nao humanoid robot made ​​by Aldebaran, France, will be part of open source projects. Source code for programming the Nao 'robot' in the near future may be freely accessible and can be modified by all people as desired. Nao is known as quite comprehensive humanoid robot model. Since Sony's Aibo robotic dog stop their project some time ago, the robotics community chose Nao to be a model, Some example in the activities of a RoboCup Soccer. 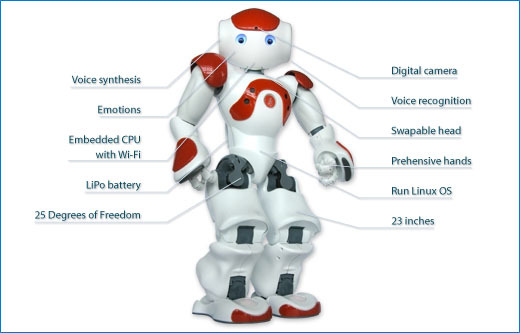 "With experience of developing embedded systems for five years, we want to share middleware, core communication library, cross platform developing tools, and modules we made ​​essential to the researchers, developers, and new projects in humanoid robot word," said Bruno Maissonier , founder and CEO of Aldebaran in a press release reported by the site Spectrum, IEEE, last week. Indeed there has been no details of Nao will going to O​pen Source and will be retained to be proprietary. However, overall, Aldebaran is committed to provide most of the Nao robot source code to the community. However, to be able to tamper with Nao robot certainly still have to buy the Nao it self to Aldebaran or near robotic store.